For many of us, our idea of paradise is setting sail on the open water, meandering towards the sunset without a care in the world. There are so many options when it comes to choosing a boat – do you want to sail for sport, excitement, relaxation, or pure joy? If you want a boat that gives you plenty of space, a motor yacht may be for you. They often offer large cabins as well as practical outdoor spaces, so you can combine the comforts of home with the joy of being out on the water. Running costs for motor yachts may be more expensive than sailing yachts but hopefully do not lean over as much! 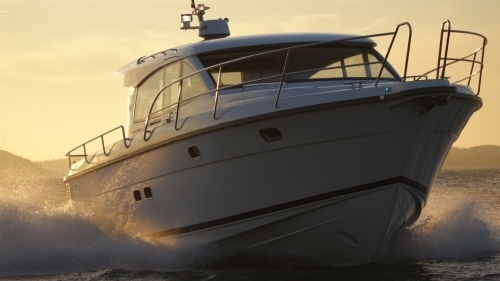 Costs will vary considerably depending on engine size but there are so many benefits to owning your own motor cruiser. A typical cruising speed for a motor yacht is around 20 knots, with top speeds between 25 and 30 knots depending on the model. Compare this to a top speed of around six knots for a typical sailing yacht, and if you want to go when you like and get there quicker, the choice is obvious. For comfort space and stability, a motor yacht normally comes out top, though how much space and comfort you will have will obviously vary with the size of the vessel. With so many boats to choose from you will be spoilt for choice, but once you have set your sights on your dream motor cruiser, you will be opening yourself up to the exciting world of cruising and all the beauty and enjoyment that being on the water has to offer. If you would like any information on how we can help you fund your dream yacht, call 01933 304791 or contact us using the form on the right.